With ever-rising geriatric population, the market for hip reconstruction devices has gained an impetus across the world. The increasing incidence of hip injuries and fractures, osteoarthritis, and wearing down of joints over time in aged people has fueled the need to reconstruct their hip joints, which is reflecting significantly over the demand for hip reconstruction devices. The overall opportunity in the global market for hip reconstruction devices was worth US$5.68 bn in 2016. Going forward, the technological advancements in these devices are anticipated to continue propelling this market over the next few years, bringing in exceptional growth. On a wider level, the global market for hip reconstruction devices is assessed on the basis of the product, indication, and the end user. Revision hip replacement device, primary cemented hip replacement device, partial hip replacement device, primary cementless hip replacement device, and hip resurfacing device are the key products available in this market. Among these, the demand for primary cemented hip replacement devices is relatively higher. Over the forthcoming years, this demand is likely to increase substantially, adding US$126.6 mn per annum in revenues over the period from 2017 to 2022. By indication, the worldwide market is bifurcated into rheumatoid arthritis, osteoarthritis, and trauma. Elderly people, suffering from osteoarthritis and rheumatoid arthritis, are the main consumers of hip reconstruction devices across the world. Hospitals, ambulatory surgical centers (ASCs), and orthopedic clinics have surfaced as the main end users of hip reconstruction devices. The demand for these devices will be comparatively higher from hospitals in the years to come. On the regional basis, the worldwide hip reconstruction devices market is considered to have a reach across Asia Pacific excluding Japan (APEJ), the Middle East and Africa (MEA), North America, Europe, and Japan. With an expected US$2.11 bn in revenues by 2017, North America is the current market leader. The increasing preference for minimally invasive surgeries among patients and medical practitioners is projected to fuel the demand for hip reconstruction devices in this region over the next few years, ensuring its dominance. The presence of a large pool of the manufacturers of hip reconstruction devices is also projected to support the market in North America in the near future. Europe, with a CAGR of 5.90% between 2017 and 2022, is expected to retain its second position throughout the forecast period, thanks to the presence of advanced medical infrastructure and favorable reimbursement policies. Among other regional markets, Asia Pacific excluding Japan is anticipated to report a significant rise at a CAGR of 6.20% during the period of the forecast. The steady increase in the disposable income of consumers in developing Asian countries, such as India, China, and South Korea, enabling then to afford expensive treatments, is the key factor behind the growth of the Asia Pacific market for hip reconstruction devices. In addition to this, the thriving medical tourism industry in this region is projected to support this regional market over the next few years. The global market for hip reconstruction devices is highly competitive and fragmented on nature. United Orthopedic Corp., MicroPort Scientific Corp., Exactech Inc., Waldemar LINK GmbH & Co. KG, Corin, Zimmer Inc., Braun Melsungen AG, DePuy Synthes, Smith & Nephew, and Stryker Corp. are some of the key manufacturers of hip reconstruction devices across the world. Of late, the global market for hip reproduction device has been witnessing a significant rise in its valuation. The technological advancements, continued introduction of new and efficient implant techniques, increasing demand for minimally invasive procedures, and the marketing strategies taken up by device manufacturers, together, are boosting this market substantially. This research report provides a thorough assessment of the past and the current state of the worldwide hip reconstruction devices market and its key elements. The report, which has been formulated with the help of market data that has been collected by applying a number of primary and secondary market research approaches, also offers a decisive account of the key driving forces, restraints, and various significant past and present trends. It also presents an analysis of the accumulative impact of these factors on the overall development of this market over the period from 2017 to 2022. The research report estimates and forecasts the hip reconstruction devices market on the global and regional levels. It provides the forecast between 2017 and 2022 with 2016 as the base year. It consists of a comprehensive value chain analysis for each of the market segments and provides an exhaustive view of this market. Value chain analysis also offers detailed information about value addition at each stage. The study further provides a deep insight into the key market indicators that affect the growth of the market. It analyzes the opportunities in the worldwide market for hip reconstruction devices on the global as well as the regional level. The growth drivers, restraining factors, and opportunities mentioned in the report are justified using qualitative and quantitative data, which have been verified through primary and secondary resources. Furthermore, it also presents a substitute analyses of hip reconstruction devices and the global average price trends. In this research study, a detailed assessment of the global market for hip reconstruction devices has been performed on the basis of various market parameters, including the product, indication, end user, and the regional spread of this market. Based on the product, the market has been classified into Revision hip replacement device, primary cemented hip replacement device, partial hip replacement device, primary cementless hip replacement device, and hip resurfacing device. Based on the indication, the market has been segmented into rheumatoid arthritis, osteoarthritis, and trauma. Based on the end user, the market has been bifurcated into Hospitals, ambulatory surgical centers (ASCs), and orthopedic clinics. These segments have been assessed by taking the historical, present, and the future trends in consideration. In terms of the region, the global hip reconstruction devices market has been categorized into Asia Pacific excluding Japan (APEJ), the Middle East and Africa (MEA), North America, Europe, and Japan in this report, which talks about the historical as well as current consumption of hip reconstruction devices in these regions at length. The market segmentation includes the demand for these devices in all the regions individually. 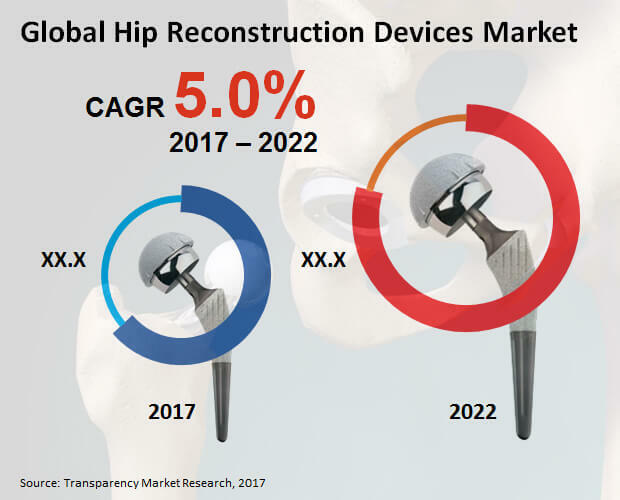 The report covers an in-depth competitive outlook that comprises market share and profiles of the leading players functional in the worldwide hip reconstruction devices market. United Orthopedic Corp., MicroPort Scientific Corp., Exactech Inc., Waldemar LINK GmbH & Co. KG, Corin, Zimmer Inc., Braun Melsungen AG, DePuy Synthes, Smith & Nephew, and Stryker Corp. are the key vendors of hip reconstruction devices, mentioned in this research study.